I really enjoy eating fish, it is easy to prepare and light. It is a go-to meal for weekdays because it is fast. Here is one of my favorite ways to cook it. This works well with just about any kind of fish. 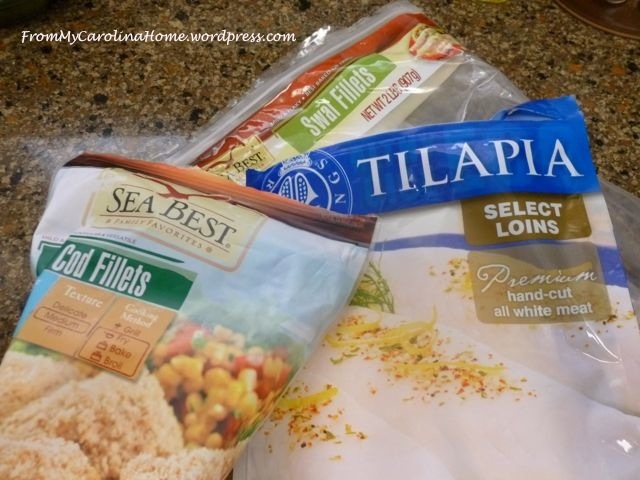 I like tilapia and swai the most, while my husband prefers cod or haddock. We can each have what we like with this method. I usually defrost the frozen filets overnight in the frig. 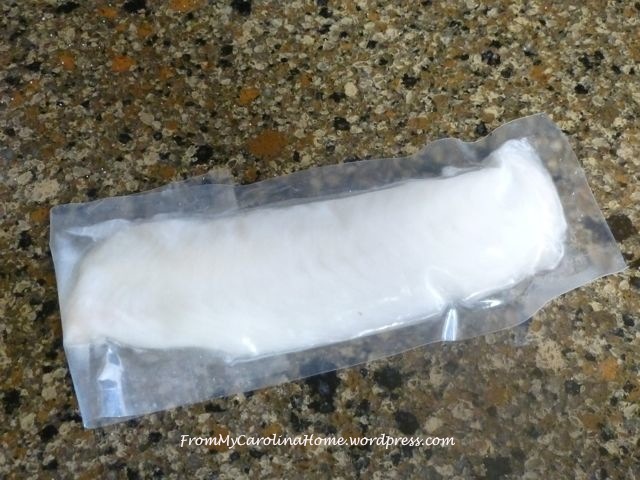 In a pinch, you can thaw them in about an hour by soaking the sealed plastic pouch containing the fish in a bowl of room temperature water. Don’t take them out of the packet until they are thawed. Start by seasoning the fish any way you like, maybe with lemon-pepper and garlic salt, or whatever you like, even blackening spice blends if you like it hot. Then begin heating a pan over medium high heat with a spritz of olive oil, and add some chopped onion. Cook until the onion is translucent, then add your fish filets. You want to hear the sizzle when you add the fish. Cook for a few minutes until they are about half done. Depending on the thickness of your filet this can take 3-8 minutes. 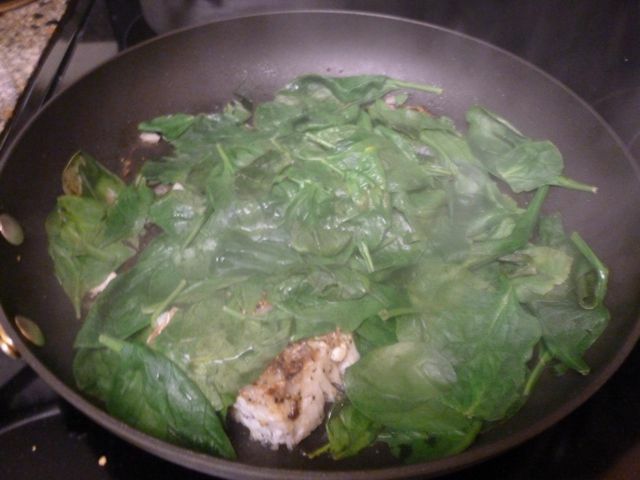 When you flip the filets over, cover them up with raw spinach, put the lid on the pan and lower the heat to medium. I forgot to take a pic so I had to grab off most of the spinach so you can see the filets, cooked on one side and just turned over. 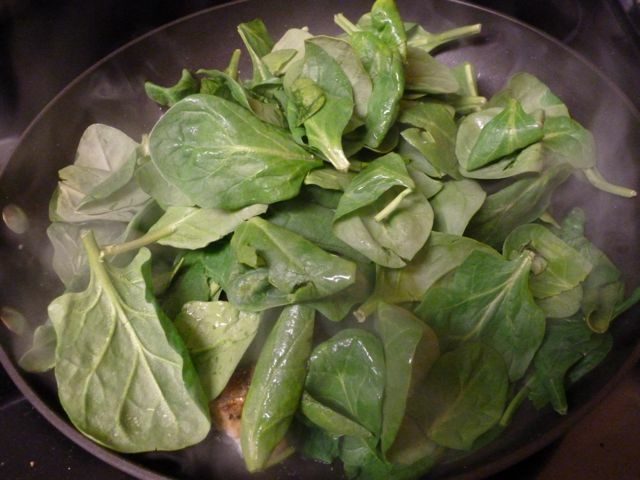 Pile on the spinach! And put the lid on. 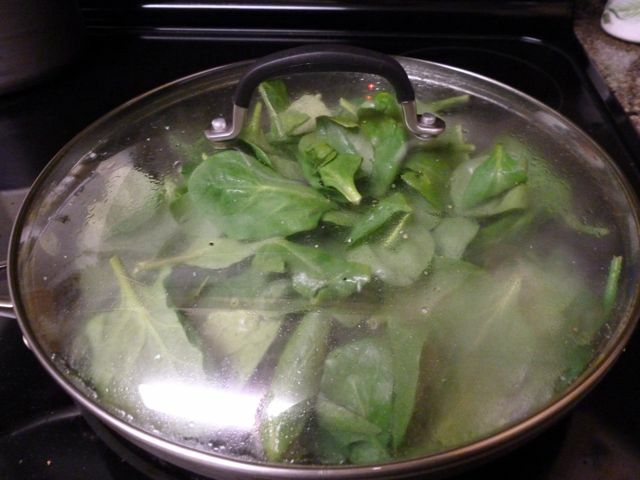 While the fish finishes cooking, the spinach will wilt. Add some grated Parmesan cheese to the top. Sliced tomatoes work great, added flavor and color. Voila, dinner. 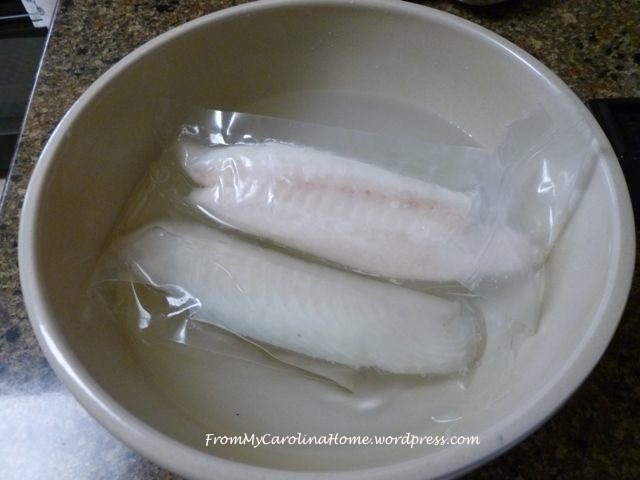 It comes together in less than 30 minutes if your fish is fresh or fully defrosted. The best part, it is very low carb and a satisfying dinner. 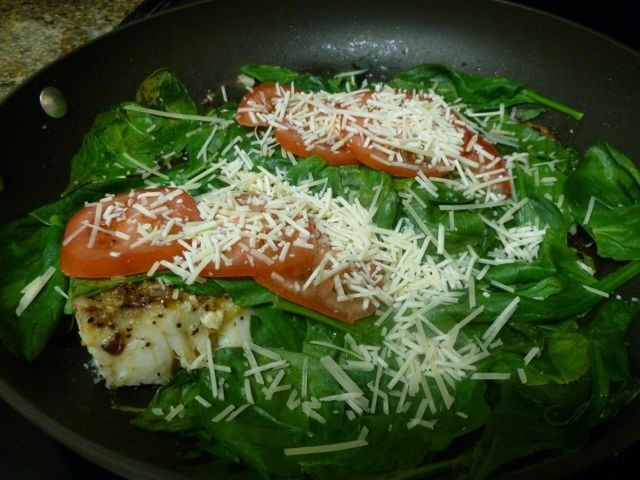 There really isn’t a recipe, saute as much onion as you want, use whatever fish you like, pile on however much spinach you want to eat, top with Parmesan or other cheese to taste, add tomatoes or other veggie to round out the meal. It is really good with some crusty sourdough bread. For more recipes, see Recipes at the top of the page. How easy is this and sounds delicious! I’ll be trying it in the next couple of days! I made this for lunch today. 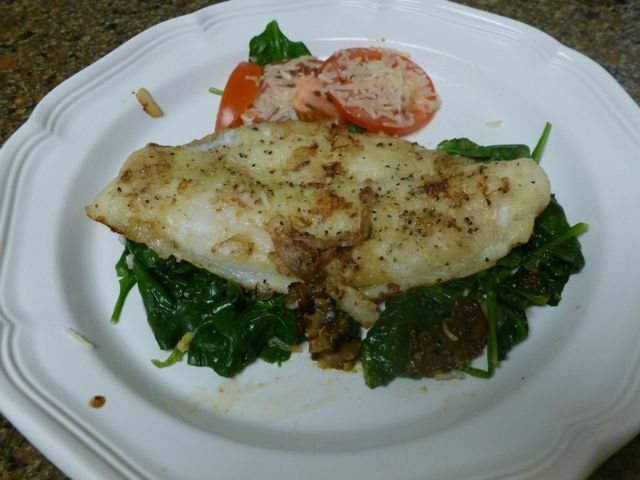 I used 1/2 a shallot, finely diced, instead of onion, and then put capers on the fish when I served along w/ chopped boiled egg bits on the spinach. It was WONDERFUL. I’ll be making this again….so easy, only one pan and a bit hit here! Thank you for sharing this idea, Carole. I’m already thinking of other variations to get different flavors. Thanks so much for your comments!! I have made it with salmon too. I think I’ll try your idea of chopped egg, yum!! I am trying the fish tonight with salmon. Sounds good.